Debt-Free Christmas – noun The act of buying Christmas gifts without incurring any debt. Save money for Christmas throughout the year – save some money for Christmas every single paycheck. 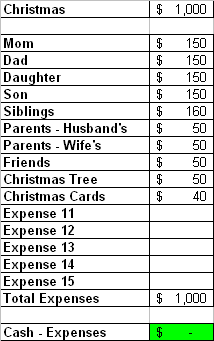 In October/November, prepare a Mini-Budget for the money you have saved for Christmas. Click this link to pull the tool up: Mini-Budget Tool. See the picture below for a sample budget. Ensure that it balances to EXACTLY ZERO! This was a reality for us this year!!! For the first time in 16 years, we are prepared for Christmas. I used to dread this holiday because of money. It would stress me out so bad, I could not enjoy it. I started a Christmas Club last year and now Christmas is a lot less stressfull. The Palmetto Bank and the South Carolina Credit Union both have Christmas Club accounts. It’s amazing how much $25-$50 per paycheck will add up to. Now is the time to start a Christmas Club for next year!!! Aww, I wish I had known about that second step earlier! I totally didn’t think of making a mini-budget!